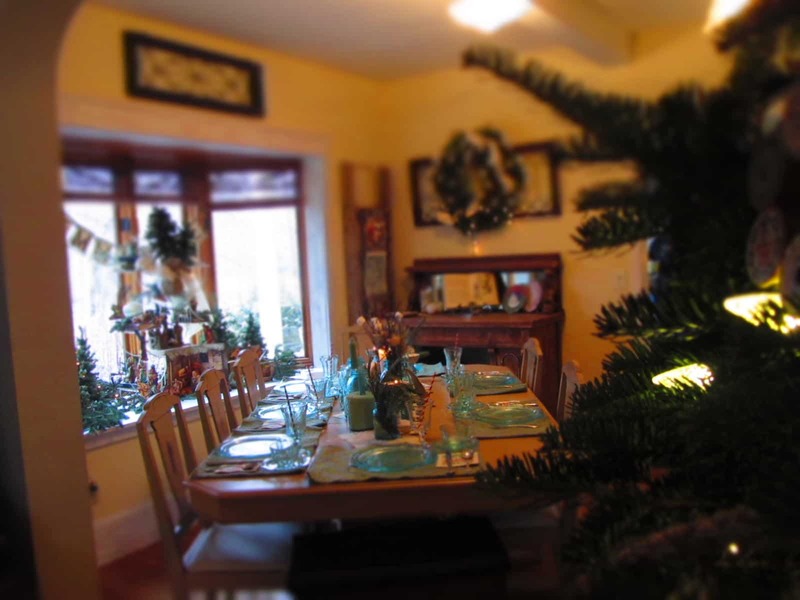 This is my annual after-Christmas post, when I share my home with you all! It’s actually turned out to be a great reminder to me of how I decorate year to year also, since my memory tends to fail me more often then not! Maybe it finally hit me this year that my house has a different arrangement of furniture each Christmas. 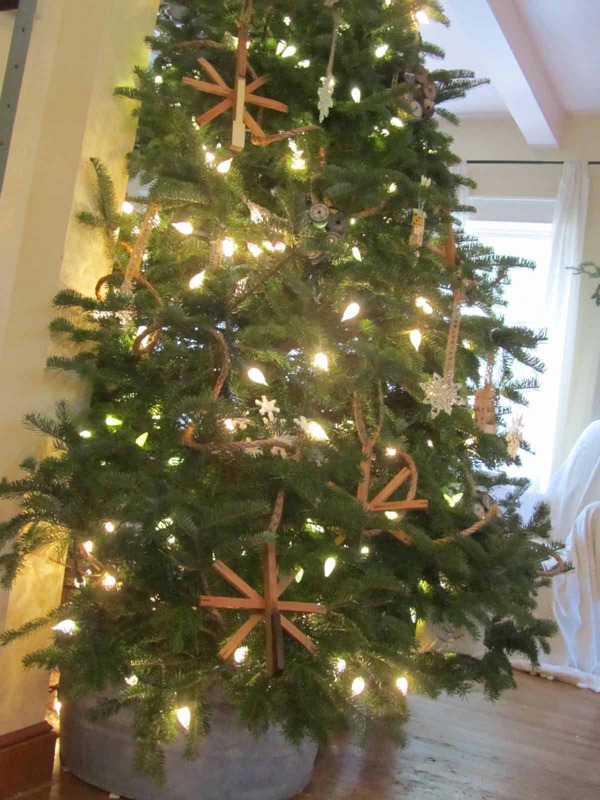 Every year I struggle with where the tree is going to land, because we don’t have a lot of space. I’ve got two new-to-me pieces in the dining room that were not here last year, so the tree ended up straddling the living room and dining room. My glue gun did a little overtime one night, as I created the ornaments. Even though there’s a rough texture going on, I think I have a “I want snowflakes” kind of theme. 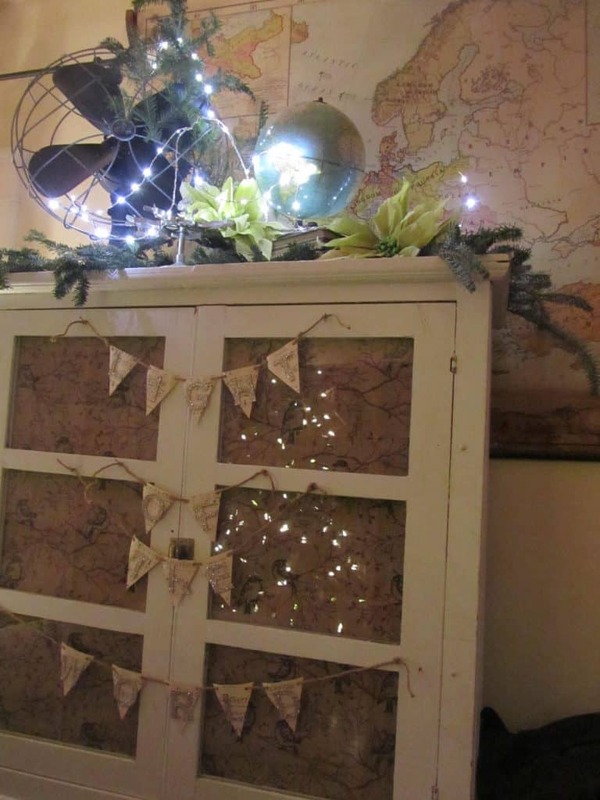 Jute rope for garland, rulers, stacked dice, wreaths of vintage thread spools, snowflakes of organ parts, combined with some white and glittery snowflakes, all contained in a vintage galvanized bucket…made for a perfectly, junky, subtle Christmas tree. 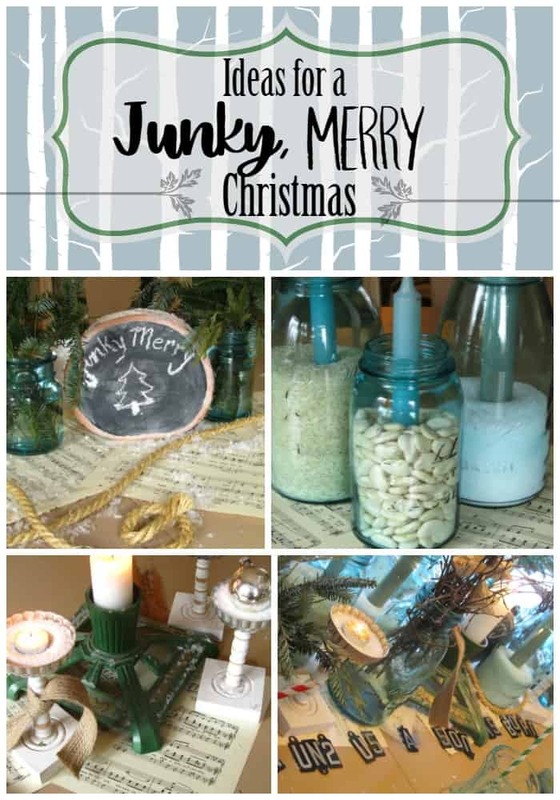 The Junky, Merry theme continued throughout the main floor. 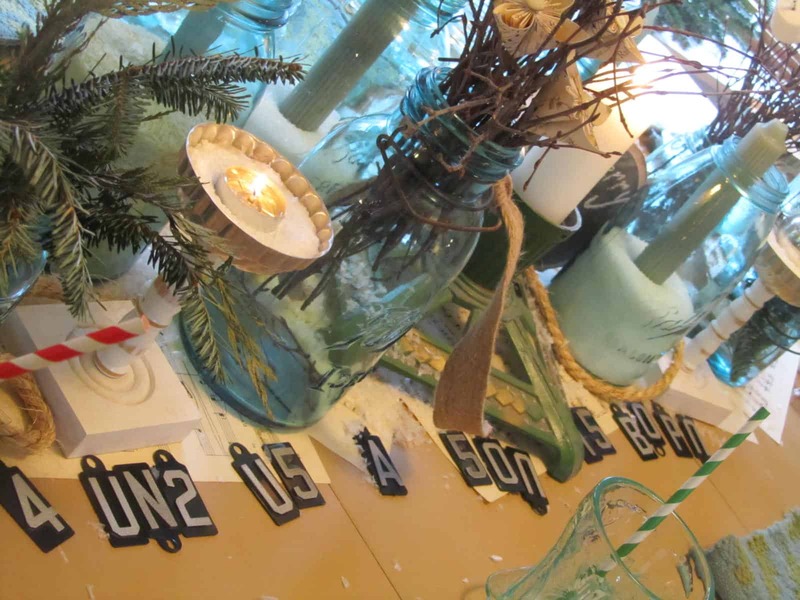 I had the most fun in the dining room, with it’s new decor. 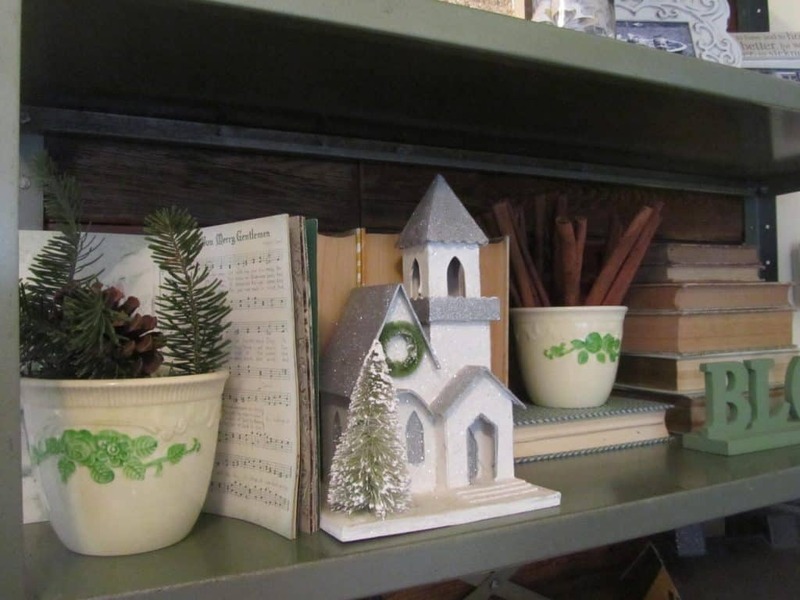 My barnboard-backed industrial shelf was treated with some seasonal flair. 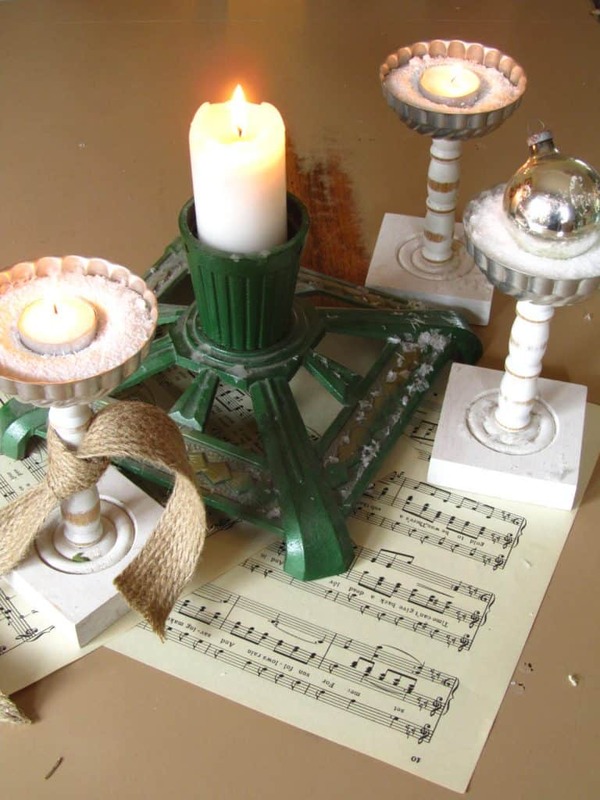 Some vintage light fixtures with votive candles glowed, a glittery church, a choir boy and some pine greens, and jingle bells added to the book pages backdrop. Mr. Fix-it hung two ladders that had come out of my parent’s barn on either side of the bay window. 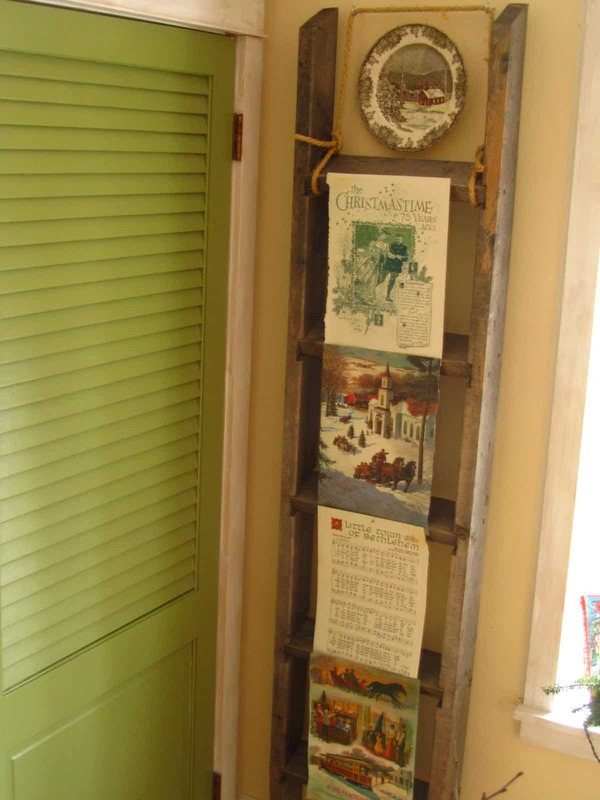 I ripped some pages out of one of my favorite vintage Christmas books and tacked the pages to each rung. 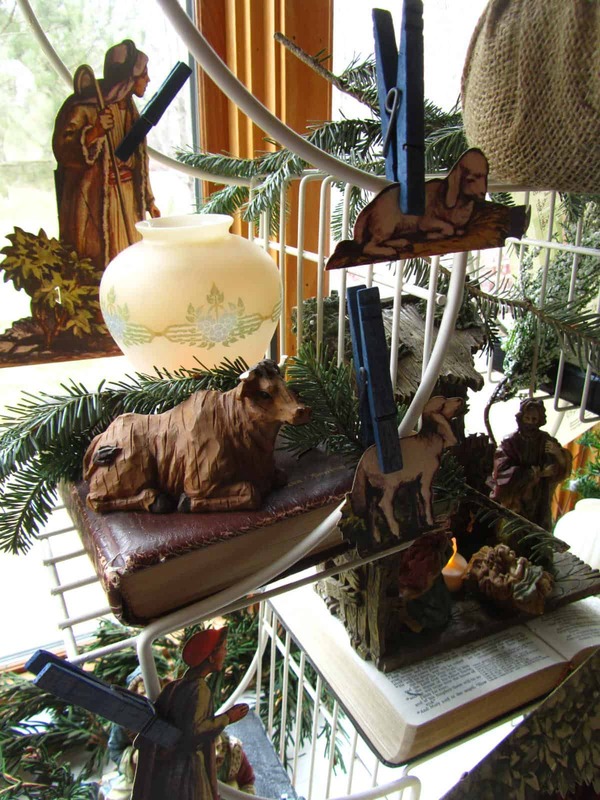 I convinced the kids to skip the Village houses this year, and instead filled the bay window with the Nativity set and my vintage paper Nativity Scenes. 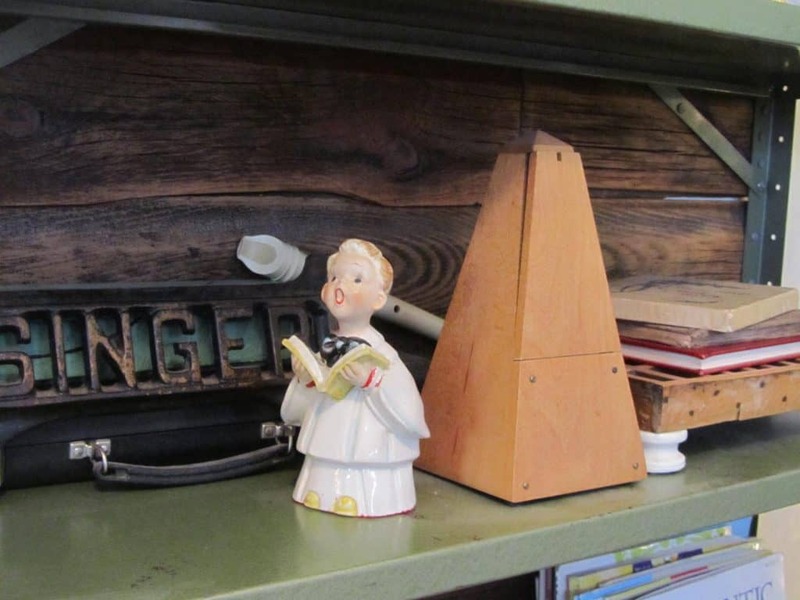 Instead of a horizontal display, I went vertical, with the angel on a top shelf of a wire plantstand, along with more old light globes. I tucked real candles and fake ones throughout. I clipped some of the figures to the stand with clothespins. My Emmanuel stenciled bunting hung across the top, with little trees and white lights across the back. My Christmas Day brunch tablescape definitely was motivated by a desire for a White Christmas! 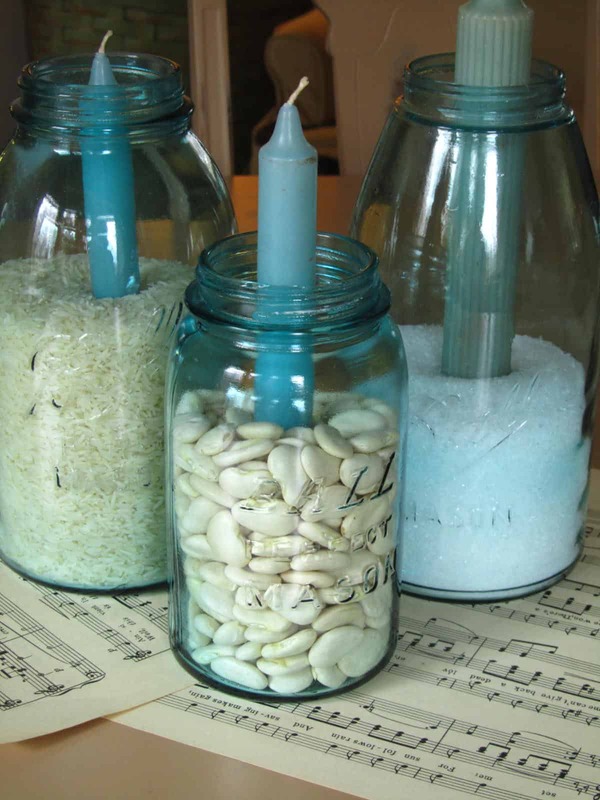 I used my aqua sandwich glass, aqua ball jars, sticks, and anything I could find white to fill the jars. 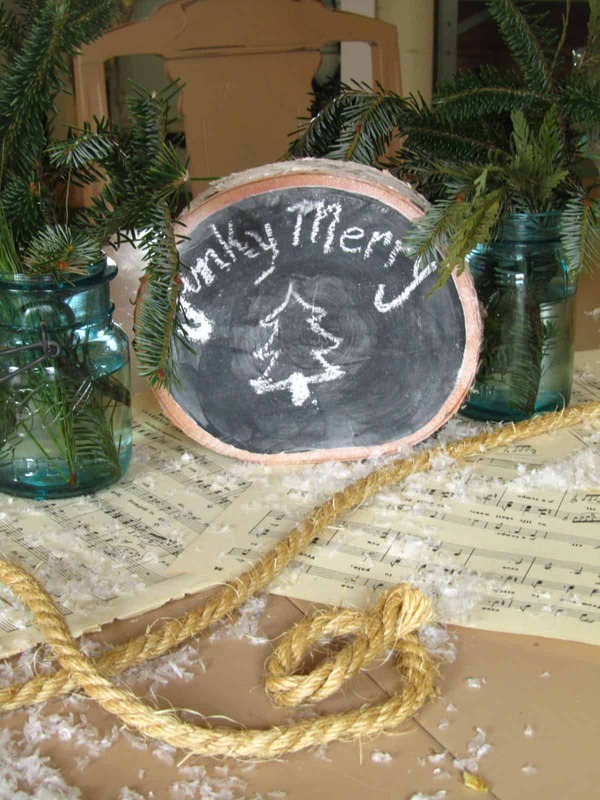 I anchored the grouping with vintage music paper, and sprinkled it all with some fake snow. It must have worked, because we got to enjoy snowflakes outside the window for quite a few hours! The textural placemats conveyed a cozy sweater-like feel. The striped straws and napkins gave just a hint of Christmas red and green. The living room was simply dressed with fake greens and white lights, along with some bunting from last year. 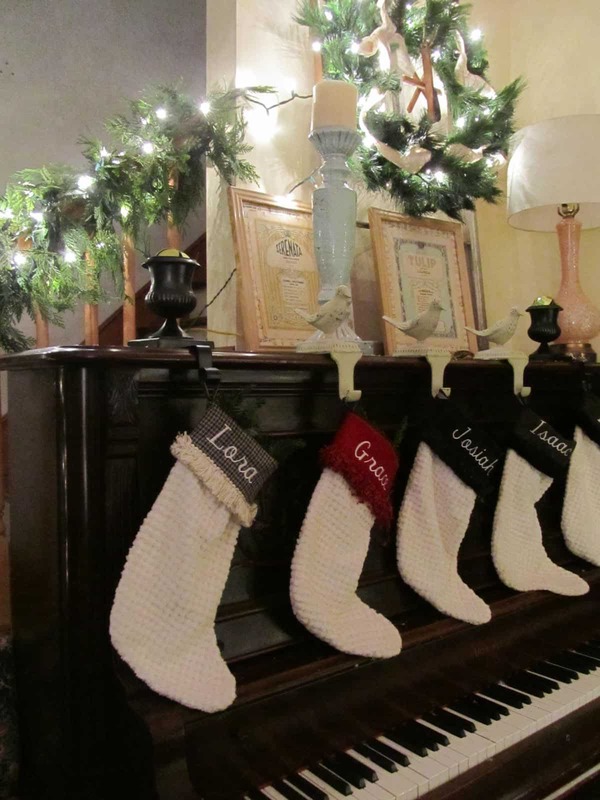 I hung the socks from the piano this year in order to keep the mantle simple. 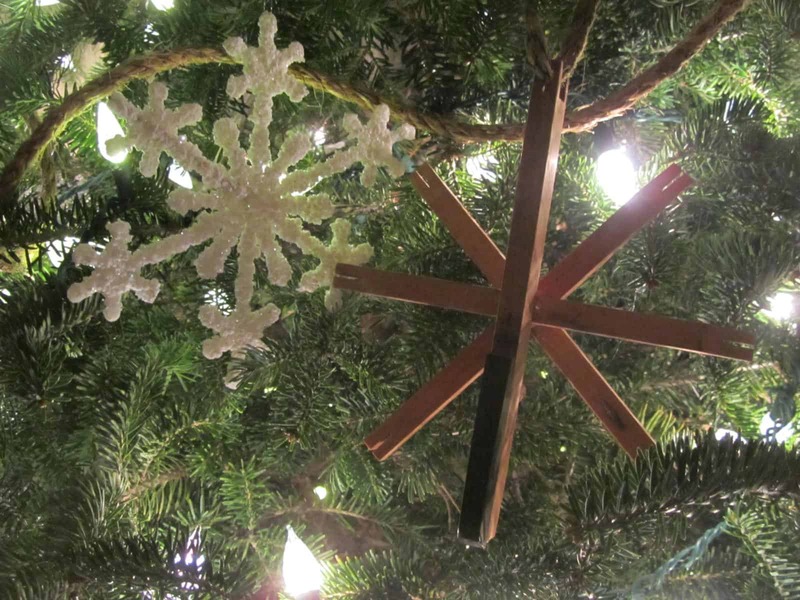 Under the map/globe vignette harkens, “Light of the World”. To see the kitchen in Junky, Merry mode, click here. …the surprised, happy look on their faces…the glow of lights around our home…tummies full of wonderfully homemade food…worshipping the King with fellow lovers of Him. 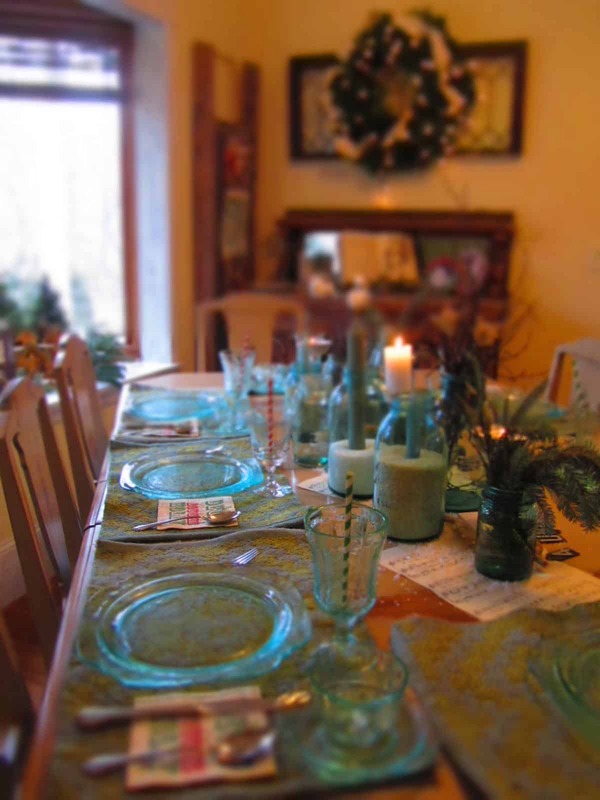 What a fun tablescape, Lora! 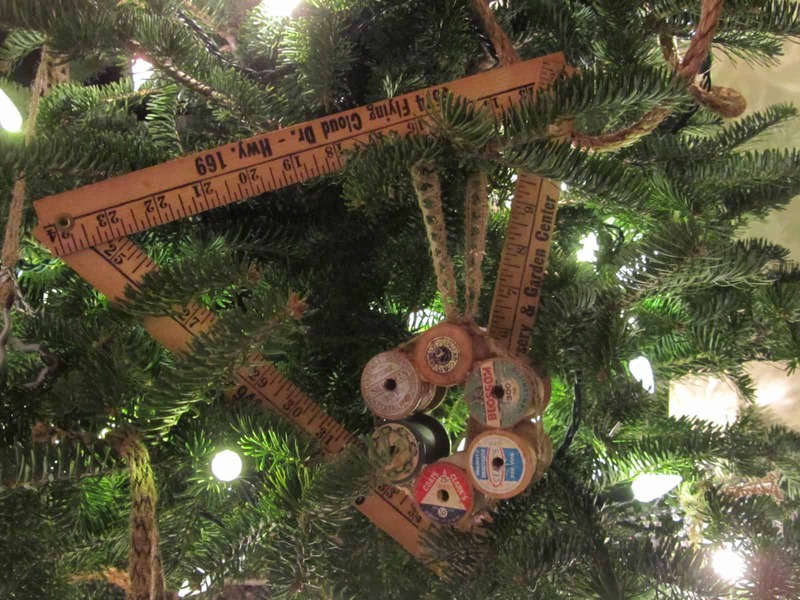 I love your dishes and the spool ornaments are adorable! Thank you for sharing at Creating Christmas & Merry Christmas! Glad you enjoyed it, Cecilia. Thanks for hosting!